The Best Milk Thistle makers --hands down! I already know I am going to love this product. I just purchased my very first bottle of this less expensive milk thistle from my very favorite Milk Thistle makers--Natural Wellness! I do notice that you get less (you get 30 capsules as opposed to the 90 that you get in their ultra thistle) but I am so glad they have this new formula, I was having some financial difficulties and wasn't able to buy the Ultra thistle like I wanted to. Now I can buy this and feel good about the Milk Thistle I am giving my fiancee' again! ***Natural Wellness--Thank you for coming up with this, I am looking forward to getting my very first bottle of this new Milk thistle! 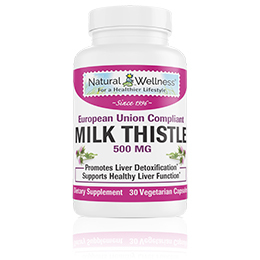 Milk thistle is the #1 recommended natural herb for liver health. Milk thistle has been used for over 2,000 years as an herbal remedy. Literally hundreds of modern research studies have confirmed the remarkable ability of milk thistle to protect your liver and body against virtually all types of damage. What Parts of the Milk Thistle Plant Provides Your Health Benefits? Silymarin is the name given to a group of flavonoids (silybin, silydianin, and silychristin) that are extracted from the seeds of the milk thistle plant. 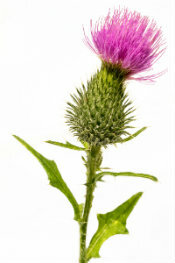 It is this silymarin that is responsible for the medical benefits of the milk thistle plant. 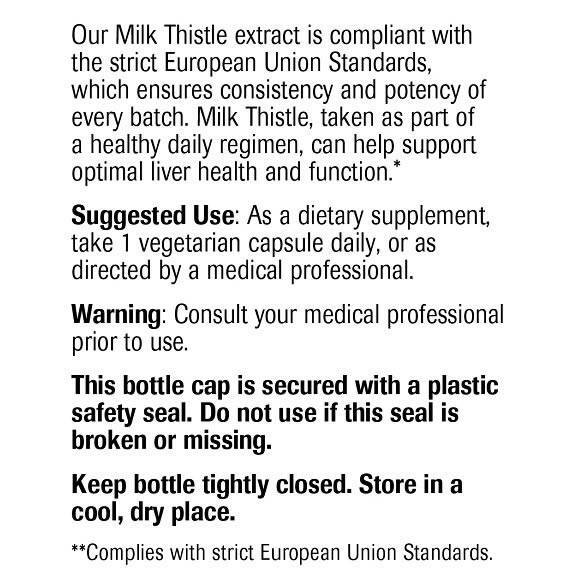 Most milk thistle products are standardized preparations to contain 70% or 80% silymarin. This means that the final product you are taking consists of 70% or 80% silymarin. 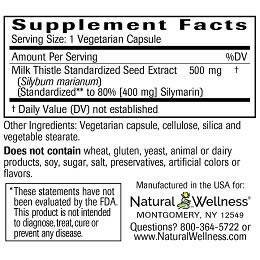 As stated above, Silymarin is the flavonoid complex from the milk thistle seeds that provides you all the milk thistle health benefits. The more silymarin, the more benefit and protection you receive. The standardization statement is important to see. 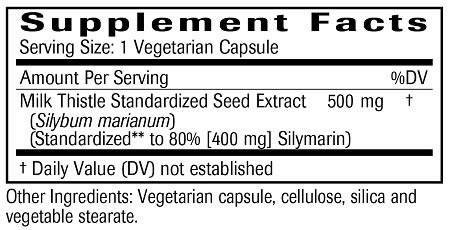 Without the label stating the actual amount of silymarin in the product, you won't know how much, if any, silymarin you are actually receiving. Some manufacturers try and mislead you by stating extract ratios and touting their large serving sizes without mentioning the silymarin content. Don't be fooled by them. Extract ratios are irrelevant for milk thistle and large serving sizes mean nothing unless you know how much silymarin is in the actual product. 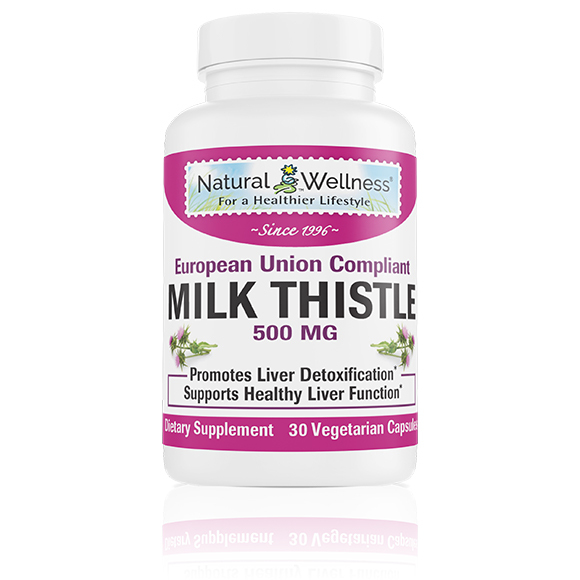 For a person looking for good milk thistle product, our Milk Thistle 500 mg is a great choice. 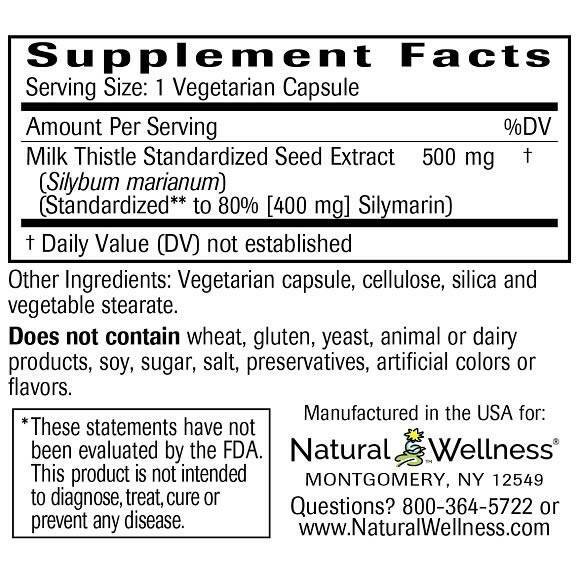 Is there a stronger milk thistle product than 80% standardized Silymarin? Yes. By studying the individual flavonoids that make up silymarin, researchers have further proven that silybin is the key flavonoid in silymarin and is responsible for 50-70% of silymarin's health benefits. Therefore, a silybin based supplement would be stronger and most beneficial for those wishing the most liver support possible. 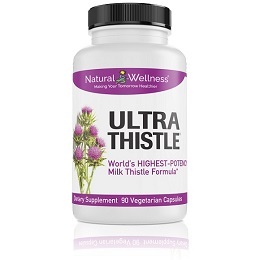 Looking for a stronger milk thistle? 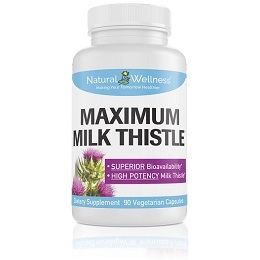 Try our Maximum Milk Thistle or UltraThistle. They are both silybin based and provide you with 10x the absorption and 20x the effectiveness of standardized silymarin milk thistle formulas. The milk thistle is the correct milligrams that I want (400mg), that I want able to find with other milk thistle products. This makes it economical as well as relieving my pain. Perfect amount of the required mg requirement for daily use. Seems to work great. I take 6 per day spread out thru the day. I like this product because it's one pill per dose, compared to others where I had to take three. I just started using this product, so I hope it works! I'd say its 5 stars if it were the Ultra milk thistle they offer. 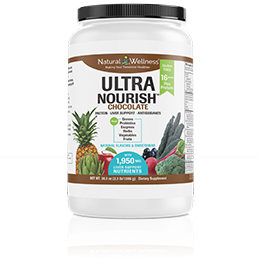 I used to buy the ultra but after finding out my liver is now considered "normal" and that they offered this new product I decided to switch over to a less expensive option. 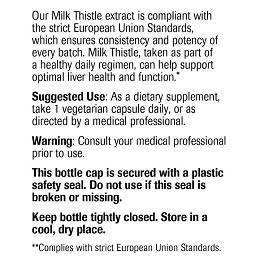 I did some searching and found that other companies offer similar milk thistle that is standardized but I trust this company so I'm keeping my business here. Also I get their emails and often buy when the products are on sale or I can get a discount (got 15% off last time I ordered). I'll update my review if I see that going with the less absorbant milk thistle reversed my progress. If that's the case I'll just go back to the ultra. As a dietary supplement, take 1 capsule daily with a meal or as directed by a medical professional. Milk thistle (silymarin) may reduce the effectiveness of oral contraceptives, therefore backup birth control methods should be used while taking milk thistle supplements. Milk Thistle 500 MG is MANUFACTURED in the USA to meet FDA strict current Good Manufacturing Practice regulations (cGMP).